Travel 2017. Day 5. Comillas. Gaudí’s El Capricho. Friday, September 29/17. 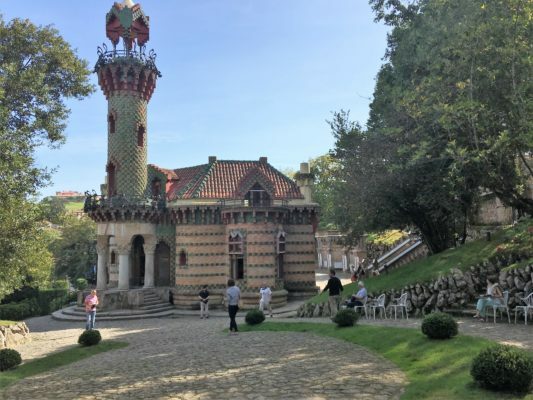 Today we decided to head for the coastal town of Comillas, (18 kilometres/11 miles west of Santillana) primarily because we wanted to see Antoni Gaudí’s building, El Capricho. Gaudí was a Catalan architect whose name is synonymous with Barcelona, and especially with La Sagrada Familia church (The Holy Family). 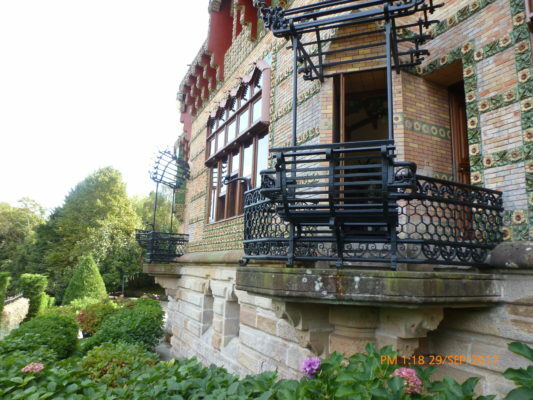 Margaret and I had seen most of his work in the Catalan capital on previous visits and admired his original architectural innovations combining Gothic, Moorish and Far Eastern elements with the endless “structures” visible in Nature. So, El Capricho was a must see, and would provide a fascinating contrast with Frank Gehry’s unconventional Art Museum which we had seen a couple of days before in Bilbao. 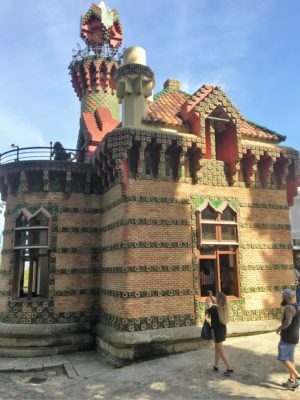 Gaudí was only 31 and relatively unknown when he was commissioned in 1883 to design a summer home for a local wealthy bachelor, Máximo Díaz de Quijano, who had made his fortune in Las Indias (the Americas). In the same year, Gaudí was contracted to build Casa Vicens and to continue the construction of La Sagrada Familia in Barcelona (following the resignation of the original architect –Francesc de Paula del Villar). Heavily committed to his work in Barcelona, Gaudí appointed his friend and fellow architect, Cristóbal Cascante, to oversee the construction of El Capricho. 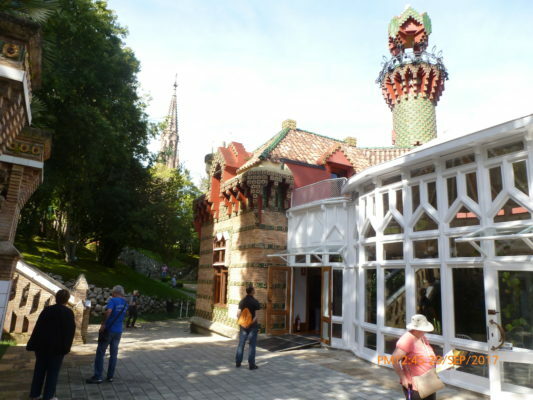 In fact, there is no record that Gaudí ever visited Comillas, although given his almost obsessive control over his projects, it seems unlikely that he would not have visited at some point. El Capricho is located on a wooded hilltop, next to a family pantheon designed by another Catalan, Joan Martorell (who was responsible for getting Gaudí selected to continue with La Sagrada Familia). 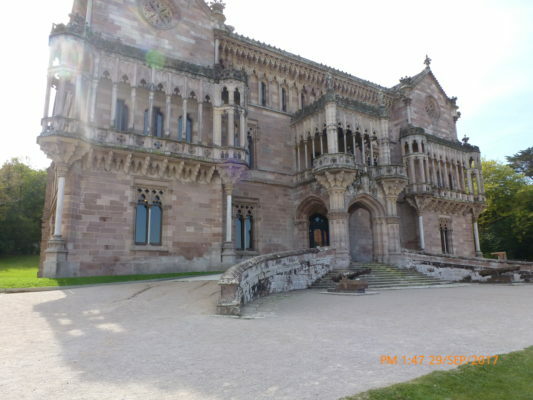 Another building on the hilltop, the neo-Gothic Sobrellano Palace (1882-1888), completes the three structures designed by Catalans.The palace was also designed by Martorell and the owner, another wealthy fortune maker in Las Indias, was the Marquis of Comillas for whom Díaz de Quijano had worked as a lawyer. (There was also a marriage connection: Don Máximo’s sister, Benita, married the Marquis’s brother). Having the Gothic Palace so close is not only great for comparison, it throws into relief Gaudí’s boldness and originality. El Capricho, translated as “whim,” “fancy,” or “mood,” lives up to its name: it has a sunny playful quality, and although its shape is irregular it is a compact building solidly anchored to the ground. The heavy, pillared main entrance is set off at an angle over which rises a minaret-like circular tower topped by a delicately balanced canopy. El Capricho. Entrance with minaret influenced tower. To one side of the entrance there are two quarter round walls linked by a half round structure punctured by two windows. Immediately noticeable is the sunflower motif running throughout the exterior and stretching up the tower to the canopy. Sandstone-coloured brickwork, plain green tiles and green friezes with vegetal designs (in which the sunflowers are set) and warm reddish-brown roof tiles complement the warmth conveyed by the sunflowers. Wrought iron mini balconies accompanied by wrought iron coverings add to the unconventionality of the building. 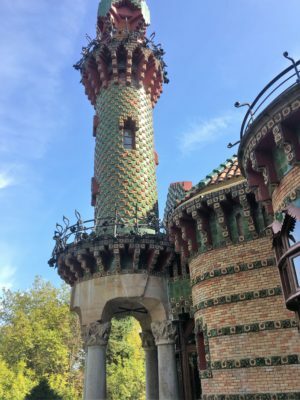 El Capricho is in all aspects striking, with one feature particularly noticeable: the brickwork around windows, doors and notably the upper part of the tower and the canopy. If you look closely, might they remind you of Lego pieces? El Capricho. Built in Legoland? At least, that was my first reaction: Gaudí had anticipated the basic structural components –units– used in Lego! El Capricho is a warm, welcoming house, custom designed for Don Máximo. Filled with light, its rooms are oriented to allow maximum sunlight to complement their function. Don Máximo’s large bedroom and balcony face the east to receive the morning sun; the west side (next to the entrance) contains Don Máximo’s office. El Capricho. Conservatory to the right. The south is an elongated conservatory where Don Maximo could indulge his love of plants and entertain guests, while on the north side, Gaudí placed a high-ceilinged salon for socialising and music. El Capricho. 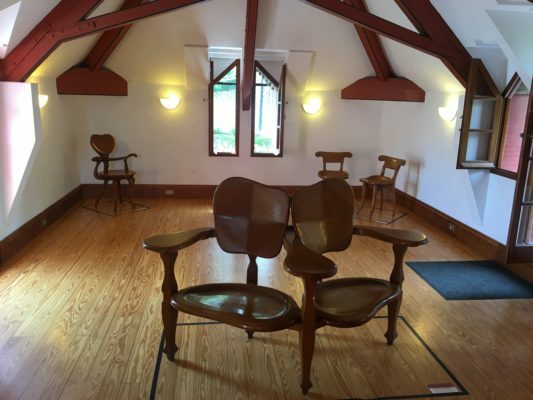 Seats designed by Gaudi. Large windows ensured plenty of light for the salon while wrought iron seats on two small balconies were angled inward to admire the decorative north wall. El Capricho. Wrought iron seats. Don Máximo was an amateur botanist and lover of music, and Gaudí –mindful of Don Máximo’s hobbies— weaved elements of these into the house’s whimsical decoration. El Capricho. Stained glass window. 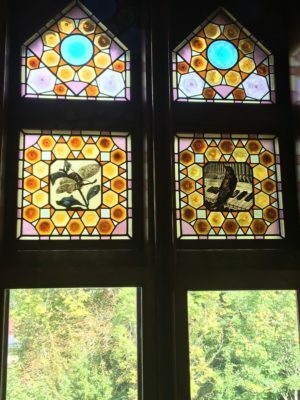 The best examples are to be found in the stained-glass windows in the bathroom adjoining the main bedroom: in one window, a dragonfly is plucking a guitar while in the window alongside a blackbird is cheekily perched on the keys of a piano. Unhappily, before the house could be completed, Don Máximo fell ill with liver failure. Work was stopped so that he could move in and at least enjoy a brief stay in his dream home. He died in his bedroom after a week, only 44 years old. Margaret and I spent a few hours at El Capricho before heading to Sobrellano Palace, a short walk made longer because the gate between the two properties was shut. The palace was closed so we could only view the moody, neo-Gothic exterior. The contrast with El Capricho’s cheerful/ sunny, unconventional exterior could hardly be more pronounced. By now we were hungry and especially anxious to find a restaurant/ bar where we could get fresh grilled anchovies (which are nothing like the tinned/ canned variety). 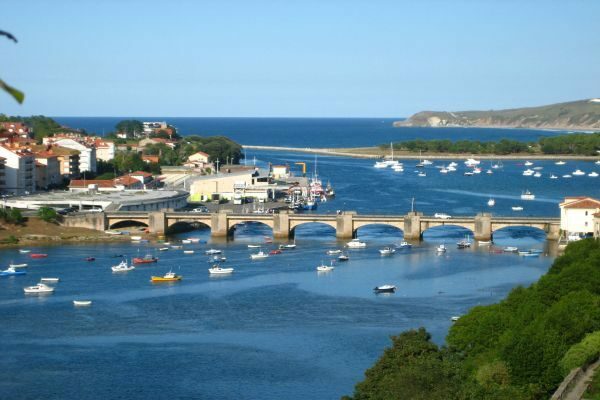 Cantabria is noted for its seafood and we had missed out on anchovies when we were in Santona. Comillas, we thought, would make up for it. Unfortunately not so. We inquired at a few restaurants but, no, they did not serve fresh anchovies, only tinned. What to do? Then we remembered that on our last visit to the north we had enjoyed fresh anchovies in San Vicente de la Barquera, just over 13 kilometres/ 8 miles to the west on a partially coastal road. This was a very pleasant, 15-minute drive with glimpses of the sea. 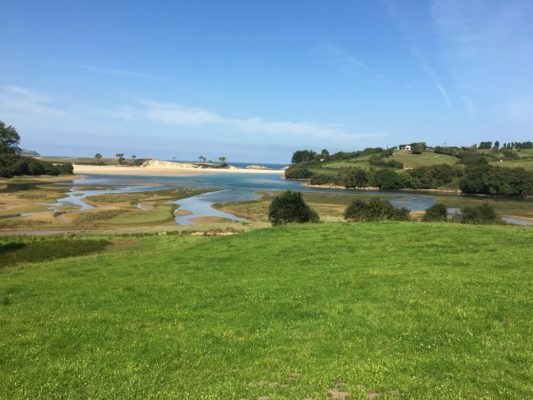 Oyambre Natural Park, between Comillas and San Vicente de la Barquera. Descending into San Vicente, we enjoyed a spectacular, sweeping view of the ría/ estuary which the town straddles. We found parking just across the river and then, following the recommendation of the parking attendant, we walked back over the bridge to a waterfront street filled with restaurants. It was late afternoon and it was busy, and it seemed that virtually all the restaurants offered fresh anchovies. After eventually finding seats at El Pescador (The Fisherman), we made the most of it … not only grilled anchovies, but also grilled sardines and calamares a la romana (squid in light batter). The portions were generous and with a large mixed salad (lettuce, tomatoes, onion, olives, tuna, asparagus, and sliced boiled egg) and two glasses of white Ribeiro wine (from Galicia), the bill came to a very modest 38 euros. Back in Santillana, we took an extended stroll through the old town again, decided we’d eaten enough for the day and ended up relaxing in the small garden of our Posada.